BYLT is proud to announce the acquisition of the first open space preserve in the Higgins Corner area of Nevada County. 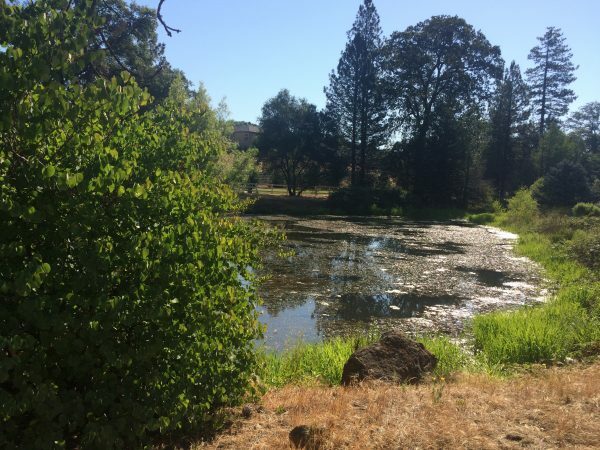 Earlier this month, Bear River Recreation and Park District (BRRPD) donated 1.4 acres of open space known as Higgins Pond Preserve to the Land Trust. Located on the corner of Combie and Cascade Crossing Roads (Higgins Corner), east of Highway 49 near Lake of the Pines, the preserve is considered sensitive habitat and will be opened to the public for guided visits and restoration workdays. “It’s the first nature preserve in an area that is designated for high-density development. Saving places with high natural values, especially for people to visit, is important to the sustainability of a community,” said Executive Director Marty Coleman Hunt. The preserve includes the Ragsdale Creek riparian corridor, a pond, and an open space buffer along the northern edge of a re-vegetated upland. Wetlands are some of the most productive ecosystems in the world. In recent years development pressures have caused rapid decline. “We are here to ensure the wetlands remain intact and functioning. This will help to protect from floodwaters and assist by filtering toxins out before entering the larger river systems,” said Director of Land Stewardship Erin Tarr. Higgins Pond was part of a 31-acre, 80-lot subdivision known as Cascade Crossing (Saddle Ridge Estates).This fall, BRRPD transferred ownership of the pond to BYLT to operate as an aquatic nature preserve. Conserving sensitive habitat within high density development is crucial for sustaining local wildlife populations. Native foothill yellow-legged frogs and some warm water fish are abundant in the pond. The wetland could provide habitat for mallards, Canada geese, black phoebe and belted kingfisher. A beaver is known to use the area and Western pond turtles could become regulars if basking sites were made available. The site has the potential to serve as an outdoor classroom for area school groups. “We are excited to work with local schools and volunteers to study the site and work together to build and monitor bird boxes, install native plants, build turtle basking rafts, and be a part of the Higgins Corner community,” said Erin Tarr. BYLT will prevent encroachment and maintain the existing biological values at the preserve for the benefit of the natural habitats currently existing there forever. Stay tuned for a ribbon cutting and volunteer community work days in the coming year. Earlier this month, BYLT launched a community campaign with a timely message and call to action: “Keep It Wild. Protect Open Space. Donate to BYLT’s Save Land campaign.” Founded 27 years ago, BYLT is a community-supported not-for-profit organization that to date has preserved over 12,000 acres with an ambitious goal of conserving 20,000 acres by 2020. This season, an anonymous local donor has stepped forward with a generous gift, to support the land conservation work of BYLT and match dollar for dollar every donation gifted to BYLT’s year-end Land Appeal, up to $40,000.